Tando Resources (ASX:TNO) has announced that a heliborne magnetic survey has delineated outstanding targets which provide more strong evidence of the potential for a low-cost Direct Shipping Ore (DSO) operation at its SPD Vanadium Project in South Africa. The high-resolution survey has clearly delineated a host of the shallow, high-grade vanadium pipes which sit within a three kilometre radius of the established vanadium deposit at SPD. Surface sampling conducted by TNO at these pipes returned high-grade vanadium assays which were consistently above 2% V2O5. 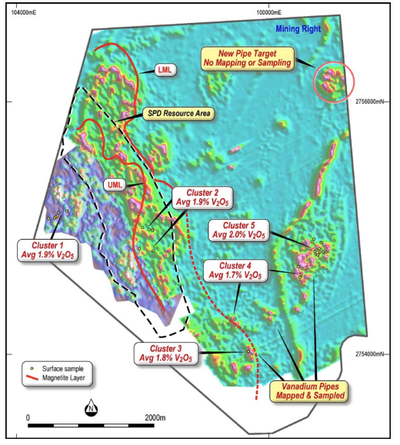 The company has previously mapped the pipes based on surface traverses over outcropping mineralisation — but the magnetic survey shows the pipes are of a much bigger scale than thought. One cluster of pipes measures 600m by 600m alone. The magnetic survey has also identified a new 400m by 400m cluster of pipes in the north-east of the project which have not been mapped or sampled. In light of these strong results, TNO has decided to expedite plans for a maiden drilling program at these vanadium pipes with a view to establishing a low-cost DSO operation as soon as possible. To help fast-track this strategy, the company is investigating flying in a heli-rig rather than bringing in a drilling rig over land. This is expected to enable drilling to start earlier than if earthmoving was required. In addition, the company is commissioning a marketing study into the potential market and pricing for the DSO product, specifically the product specifications desired by end users. The vanadium pipes surround the SPD deposit, where there is currently a foreign Resource of 513 million tonnes at a grade of 0.78% V2O5, defined under the SAMREC code. 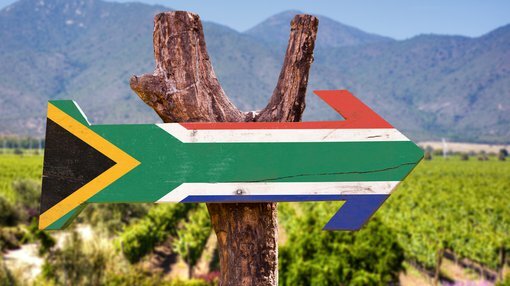 TNO recently received notification of grant of the Mining Right for the SPD Project by the South African Department of Mineral Resources. This paves the way for drilling to start during August at both the SPD deposit and the surrounding pipes. TNO Managing Director Bill Oliver said the company had established a two-pronged strategy at SPD. “These magnetic results strongly support our view that the pipes could be sufficient to host a DSO operation which would be very low-cost to establish and operate. It should be noted that this is an early stage company, so investors should seek professional financial advice for further information if considering this stock for their portfolio. Oliver said discussions were underway with a heli-rig contractor with a view to starting the drilling campaign on the pipes at the same time as the Phase 1 drilling at the SPD Project. Drilling at the SPD deposit will be aimed at converting the current “foreign Resource” to a JORC-compliant Mineral Resource Estimate (MRE). TNO expects the MRE will be published by October, 2018. Following completion of the Phase One drilling program, the company will move straight into Phase Two, which will be aimed at upgrading the maiden JORC Resource to an Indicated category (provided results are as anticipated). To achieve this goal Phase Two is currently designed to comprise 58 holes for 5550m.